The correct direction of Al-Qiblah is to the Southeast/East-Southeast from North America (USA and Canada). Advisors to Islamic Society of North America have in the recent past recommended that the direction of Al-Qiblah is towards the Northeast/Northeast-North from North America. This paper, based on religious and scientific data, explains the reasons for facing towards the Southeast/East-Southeast for Muslims living in North America while offering their prayers. The Northeast propagators are misleading the Muslim Umma living in North America by introducing “INITIAL GREAT CIRCLE COURSE” as the middle and final direction to Qiblah. “Direction” means a straight line between the observer and the object. The bearing keeps changing along the Great Circle and hence the direction and as such the Great Circle cannot be considered as the “Direction”. If you wish to follow a Great Circle you got to divide it into numerous short straight-line segments and find the WAYPOINTS for that purpose. Allah SWT also mentions in the Holy Qur’an “SHATR-AL-MASJID-IL-HARAM”, which means “IN THE DIRECTION OF MASJID-IL-HARAM” and not the short distance. Let us not confuse “Shatr-Al” with the “Short Distance”. Northeast propagators talk of using Gnomonic Projection Chart. This chart can only be used in conjunction with the Mercator Chart. You can read the Comparison between The Mercator Chart and the Gnomonic Chart in my article. This is a matter relating to prayers and the rules of the religion. Hence, in determining the direction of al-Qiblah we must rely on the religious evidences and the sayings of the scholars. The content of this Ayah includes that to be guided by the stars is a grace from Allah. Hence this means it is a religious order. It is nowhere mentioned in any text that the reliance is on the shortest distance, or on stretching a string as some intelligence-claimers voice to-day. Rather, the scholars have al-ijma^ that to determine the maharib of the mosques, one looks at the position of the country from Mecca., relying on the stars and like. The ancient and recent sayings and statements of the scholars testify to that. The Qiblah for the people of the western countries is toward East, the Qiblah for the people of the eastern countries is toward West, the Qiblah for the people of the southern countries is toward North, and the Qiblah for the people of the northern countries is toward South. If one was absent from Mecca, he is to endeavor to determine the direction of al-Qiblah because he has a way of knowing it by the stars, sun, moon, mountains, and winds. For this, Allah said in Qur^an [and marks and by the stars they guide themselves. ]The weakest of these signs are the winds for their diversity, and in the open land and seas, the strongest is the Polaris (the North Pole Star) and the sun. The scholars of the four schools have mentioned that the signs of al-Qiblah are plenty and have authored numerous books on the subject. Not any have considered the shortness or the length of the route, nor the proximity or farness from Mecca in determining al-Qiblah. Allah said in Surat Al-Ahzab, Ayah 36 which means: [When a matter has been decreed by Allah and His Messenger, there is no entitlement for a believer, man or woman, to have an option about the matter. The earth is not exactly round but what is called a geoid, that is, an ellipsoid flattened at the poles (The North Pole and the South Pole). Even in that shape, the earth is not perfect. It actually has corners in its ellipticality. These are located at Ireland, off Peru, South of Africa and near New Guinea. The North Pole and the South Pole are referred to the North and South ends of the Axis of Rotation. The axis of rotation, along which the earth revolves in front of the sun, is tilted towards the sun by 66 degrees. The earth is at a distance of about 93.2 million miles from the sun. It takes 365.256 days for the earth to travel around the sun and 23.9345 hours for the earth to rotate a complete revolution along its axis of rotation in front of the sun. The globe of the earth is marked by a network of meridians stretching from pole to pole and of lines of latitude perpendicular to them. Any location on the Earth is described by two numbers- its latitude and its longitude. If a pilot or a captain of a ship wants to specify the position on a map, these are the “coordinates” they would use. Meridian is an imaginary line of constant longitude stretching over Earth’s surface from the north pole to the south pole. Since the equator is a circle, we can divide it-like any circle-into 360 degrees, and the longitude of a point is then the marked value of that division where its meridian meets the equator. What that value depends of course on where we begin to count on where zero longitude is. For historical reasons, the meridian passing through Greenwich, England, is the one chosen as zero longitudes. It is marked as Prime Meridian. Longitudes are measured from zero to 180 degrees east and 180 degrees west, and both 180-degree longitudes share the same line, in the middle of the Pacific Ocean. The Earth undergoes a full rotation along its axis of rotation with respect to the sun in 24 hours. Thus each hour the Earth rotates by 15 degrees 360/24=15 degrees. When at your location the time is 12 noon, 15 degrees to the east the time is 1 p.m., for that is the meridian which faced the sun an hour ago. On the other hand, 15 degrees to the west the time is 11 a.m., for in an hour’s time, that meridian will face the sun and experience noon. Great Circle:- A Great Circle is a circle on a sphere’s surface whose plane is passing exactly through the center of the sphere. In other words, a great circle divides a sphere into two symmetrical parts. An arc on a great circle represents the shortest distance between two points on a sphere. An indefinite number of great circles may be drawn through any given point on a sphere but only one great circle can pass through two points (except when these points are diametrically opposite). Small Circle:- Any circle on a surface of the sphere which is not a great circle and whose plane is not passing through the sphere’s center is a Small Circle. Earth’s Poles:- The Earth’s Poles are the intersections of the surface of the Earth with the rotation axis. The poles and the rotation axis provide the prime navigation references. Equator:- The Equator is a Great Circle whose plane is perpendicular to the rotation axis of the Earth and is everywhere 90 degrees from the north (or south pole) and is taken as 0-degree latitude. It divides the earth’s sphere into two equal halves the northern hemisphere and the southern hemisphere. It maintains a constant east-west heading. Parallels of Latitude:- These are the lines of constant latitude intersections of planes parallel to the Equator with the surface of the earth and are known as small circles. They are perpendicular to the meridians. As the Equator is 0-degree latitude and the poles are at 90-degrees latitude (90 degrees North and 90 degrees South) the latitude coordinate is measured north and south from the equator. In other words, the Parallels are used to specify the arc, in degrees, of which a point is located relative to the Equator. Meridian:- A Meridian (line of longitude) is an arc on a Great Circle that extends from one pole to the opposite pole (Half of a Great Circle). The Prime Meridian which is used in international navigation was arbitrarily selected in 1884 as the meridian that passes through the Royal Greenwich Observatory in Greenwich, England. The Meridians are used to specify the arc, in degrees, of which a point is situated relative to the Prime Meridian. Parallels are measured 90 degrees north and 90 degrees south of the Equator while meridians are measured 180 degrees East and West of the ZERO MERIDIAN (Prime Meridian). The Prime Meridian and the 180 degrees meridian (also called the International Date Line) together are forming one great circle whose plane intersects the North and South poles. Location;- The earth’s coordinate system provides means to accurately locate any point on the surface of the earth. Such a position is given in an arc measured in degrees, minutes and seconds. A position report of N 31 degrees, 15 minutes, 00 seconds and W 86 degrees, 20 minutes, 00 seconds indicates that this position is situated at 31 deg, 15 min, and 00 sec North of the Equator and 86 deg, 20 min, 00 sec West of the Prime (Greenwich) Meridian. Distance is defined as a spatial interval. For all practical purposes, distance is the length of the shortest interval, which connects two points. Keeping in mind that the earth a sphere, the shortest line that connects two points follows the curvature of the earth thus, it is a great circle line. Distances may be taken by either measurement or by mathematical calculations. Measuring distances can be accomplished in several ways. Aeronautical charts are scaled, that means each inch on the chart represents a certain number of inches on the surface. The most common method is using a navigation plotter, which is calibrated for various scales. When a plotter is not available, two other options may be used. First, the distance is measured with a string or a sheet of paper. Then either calculating the distance by multiplying the measured distance by the scaling factor or by counting degrees and minutes of latitude. Each degree of latitude equals 60 Nautical miles and each minute equals 1 Nautical mile. When using the scale method, the result must be converted from inches to nautical miles. If one can see an object, then what means by the direction towards it is obvious and trivial. One faces the object and the direction goes in the straight line between him and the object. Of course, this definition only works if the object is visible. For objects or places on the earth, the object must be above the horizon. The direction could be specified by an angle from the True North. One could generalize this definition by defining the direction to be the straight line between you and the object, even if the object is not visible. A Direction can be obtained by either measurement or by mathematical calculation. An ordinary protractor can be used to measure the direction, but it is rarely used. Several styles of plotters have been designed specially to accommodate the navigators. Long- range segments are more difficult to measure than short ones. Long- range navigation involves following a great circle, which is not a straight line. This problem is solved by breaking the curved line into numerous straight line segments. The following are the mathematical formulas for calculating great circle distance and direction. To follow a great circle track, the navigator needs to adjust the ship’s course continuously because the great circle track is a curve when plotted on a Mercator Chart. Therefore, it is not really practicable to sail on an exact great circle route. In order to take advantage of the shorter steaming distance of the great circle track, mariners usually divide a great circle track between the initial position and the destination into smaller segments (waypoints) of about one to two day’s steaming time and make course adjustment at noon. The total distance is, therefore, the sum of the distances of those segments calculated by means of Mercator Sailing. The most annoying part of the great circle sailing calculation is to find out the waypoints along the great circle route. The traditional way is to determine the position of the vertex and use Napier’s rules to calculate individual way point’s Latitude and Longitude. This method is not really very complex but is not suitable for computerization as a set of conditions will need to be established in order to determine the side of the positions. A great circle is a circle on a sphere’s surface whose plane is passing through the center of the sphere. An arc of a great circle represents the shortest distance between two points on a sphere. Because a great circle line follows the curvature of the Earth, it forms a curved line rather than a straight one. In long-range navigation, great circle routes are desired. Since the great circle is not a straight line and, therefore, difficult to follow, it is divided into a sequence of shorter rhumb lines segments. The bearing keeps changing along a great circle path on the surface of the earth. For example, a great circle path may start out heading northeast, gradually changing the heading to the east, then gradually change it further to the southeast and so on. The only exceptions are the Equator and the Meridians, which maintain constant direction. The direction along the equator will be due east and due west and along the meridian due north and due south. Due East means 090 degrees, due West 270 degrees, due North 000 or 360 degrees and due South 180 degrees. Lindbergh’s flight across the Atlantic between New York and Paris in 1927 illustrates the use of short segmented rhumb lines of 100 miles that were carefully plotted to approximate the great circle path (between the two cities) resulting in a savings of 140 nmi. Lindbergh used a planning chart with a gnomonic projection where a great circle course is obtained by a straight line between departure and termination. He divided the resulting straight line (between New York and Paris) into100 mile segments and transferred the coordinates of the extremities of these segments to a Mercator chart which he used for his historic flight. For Voyage from Norfolk, Virginia to Cape St. Vincent, Portugal. A rhumb line is a straight line on the surface of the earth that crosses all the meridians at the same angle. Ideally, straight-line course segments are sought because they are easy to follow compared to curved lines. Since the lines of longitude are approximately parallel, a straight line would be a line that crosses all the lines of longitude at the same angle. Straight lines make the plotting and tracking simple. As stated above, the rhumb line is a line on the surface of the Earth which crosses every meridian (line of longitude) at the same angle. On a sphere, where the meridians are converging at the poles, a rhumb line will form a spiraling curve that eventually ends at either of the Earth’s poles. The spiral that is created by a rhumb line is a Loxodromic Curve or a Loxodrome. Since a loxodrome is not a great circle, it follows that by tracking a loxodrome a longer distance must be traveled compared to a great circle line. North, South, East and West Directions: North is facing along a constant longitude towards the North Pole. East is facing along a line of constant latitude such that the north is on the left. These directions are not the readings taken by the magnetic compass because the magnetic north is removed from the North Pole of the earth’s rotation. A magnetic compass does not point towards the True north, hence the direction measured by the magnetic compass must be corrected for Deviation and Variation depending on one’s location. It is an established fact that north is opposite to south and that the east is opposite to west. North-South lines and East-West lines meet each other at right angles. This terminology goes back to the time man was created by Allah “The Almighty”. On the earth, north is determined by the position of the Polaris (a fairly bright star) the North Star. The direction of Polaris is north. By simply observing the Polaris one can find the True North. Moreover, the observations of the elevation of the Polaris can give the latitude. Some small corrections must be made, because Polaris is 1 degree from pole, but the correction is small and unimportant for many purposes. The higher the Polaris is seen above the horizon means the closer the country of vision is to the north. The lower the Polaris is seen above the horizon means the farther the country of vision is from the north. The Polaris has extensively been used by the Navigators. The scholars have mentioned that Suhayl is another star that always points south. The sun rises in the East and sets in the West. It rises due (True) east on only two days a year, the Equinoxes. The sun is over the equator on March 21 and starts going northwards to the Tropic of Cancer, which is 23.5 degrees latitude north of the equator. On June 21 it reaches over the Tropic of Cancer. This means it covers 23.5 degrees in 92 days, thus it moves .255 degrees per day. Then gradually it moves back towards the equator and is over the equator on September 20 or 21. Then it moves further southward and reaches over the Tropic of Capricorn on December 21, which is 23.5 degrees latitude south of the equator. After September 21 it again moves northwards and reaches over the equator on March 21. The sun’s daily trip is along the lines of latitude and maintains a constant east-west direction. The sun never goes above the Tropic of Cancer and below the Tropic of Capricorn. In the US and other mid-latitude countries north of the equator (e.g. those of Europe) , the sun’s daily trip (as it appears to us) is an arc across the southern sky. (Of course, it is really the Earth that does the moving). The sun’s greatest height above the horizon occurs at noon, and how high the sun gets depends on the season of the year–it is highest in mid-summer, lowest in mid-winter. When the sun is in the northern hemisphere over the Tropic of Cancer (during the northern hemisphere summer) it can be viewed by the people, living south of the Tropic of Cancer or in the southern hemisphere, rising substantially north of due east. The people living above the Tropic of Cancer will see the sun rising towards the south of their local east. The deviations can be large for latitudes far north or south. The reverse is true when the sun is over the Tropic of Capricorn. Comments by Dr. Burton F. Jones, Professor of Astronomy and Astrophysics, University of California, Santa Cruz and Staff Member, Lick Observatory are reproduced below. These are his own personal views expressed by him, and not those of Lick Observatory or the University of California, Santa Cruz. When I talk of the north, I am referring to the direction to the North Pole of a rotation axis of the earth along a meridian. This is different from the magnetic north pole; which is the direction a compass will point. As a practical matter, a magnetic compass generally does not point true north, and one must make a correction depending on one’s location. If one can see an object, then what means by the direction towards it is obvious and trivial. You face the object and the direction goes in the straight line between yourself and the object. Of course, this definition only works if the object is visible. For objects or places on the earth, the object must be above the horizon. This means such a definition is useful only for nearby objects. One could generalize this definition by defining the direction to be the straight line between you and the object, even if the object is not visible. In the case of two points on the surface of the nearly spherical earth that line would go through the earth. The direction could be specified by an angle from true north, and an angle below the horizontal. With such a definition, in the South Pacific Islands, the direction towards Mecca would be nearly straight down. The higher an object is, the farther one can be from it and still see it above the horizon. Thus one can see the high mountains from a greater distance than low hills. This has its limitations, however. Even if an object were infinitely tall, one could see it from only half of the earth. Although nothing is infinitely tall, we can make a close approximation using the sun. The earth’s rotation axis is tilted 66.5 degrees from the plane of the earth’s orbit around the sun. Thus in summer in the northern hemisphere, the earth’s north pole is tilted towards the sun, and in the winter away from the sun. Practically, this means the places with latitudes between 23.5 degrees north and south (23.5=90-66.5), the sun will be nearly directly overhead on two dates during the year. (By overhead, we mean that a straight line between the sun and the place in question would pass through the center of the earth). When the sun is directly overhead, one can imagine a tower stretching upward to the sun. Thus, the claim is made that observing the sun at such a time determines the direction to the place the sun is over. For any given place, the dates on which the sun is directly overhead can be found by consulting the Astronomical Almanac, published by the U.S. Government printing office. To find the dates, one must know the latitude for the place in question. One then finds in the almanac the dates when the declination of the sun is equal to the latitude of the place. For Mecca (latitude 21 deg 27 min north), these dates are May 28 and July 15 (For a couple of days on either side of these days, the sun will nearly pass overhead Mecca). It is possible using the information in the almanac to find the exact Universal Time (UT) when this occurs on these dates (Muller, Spherical and Practical Astronomy as Applied to Geodesy, Frederick Ungar Publishing, New York, 1969). Universal time has a somewhat complicated definition, but is basically the time on the prime meridian running through Greenwich, England. The computation, although somewhat complicated, is straightforward. For May 28 the sun will be overhead at Mecca at 09:18 UT. Once one knows the time the sun is overhead in Mecca, one can calculate where in the sky the sun will appear for any place else on the earth where the sun is above the horizon. Again, this is a somewhat complicated, but straightforward, computation, and is explained in Muller, starting on page 29. For example, for Halifax, Nova Scotia, Canada, the sun will be 5 degrees above the horizon, and 22 degrees north of due east on May 28, at 9:18 UT. For most of North America, the sun will not be above the horizon. One could define the direction towards Mecca from a given place as the direction towards the sun at the time the sun is directly above Mecca. One does not have to actually observe the sun to find the direction, as the direction can be calculated, as shown above. This only works for places where the sun is above the horizon at that time, and that covers only half of the earth. Thus if one were to adopt this method for finding the direction to Mecca, one would still have the problem of defining the direction for half of the earth. Mathematically, a great circle is the intersection of a plane that contains the center of the earth with the surface of the earth.Except for points on the opposite sides of the earth, only one great circle can go through two points. Moreover, for travel on the surface of the earth, the shortest distance between two points is along the great circle. In general, if one travels along a great circle, ones bearing (the angle between the direction and true north) will continuously change. A segment of a great circle connecting two points on the earth is clearly the shortest distance between the two points for travel on the surface of the earth. Except for two circumstances (travel along the equator or along meridians), one’s direction of travel constantly changes along the great circle. One could, with some logic, define the direction towards a place as the initial bearing for travel to the place along the great circle. From a common sense point of view, the use of the great circle to define direction can lead to clear absurdities. Thus, the great circle joining Alaska to South Africa has an initial bearing of almost due north. Are we then to say that South Africa is north of Alaska? To most people that would make no sense. The great circle joining the tip of South America to the Phillippines has an initial bearing of almost due south. Are we then to say that the Phillippines is South of the tip of South America? Nevertheless, it is true that the above directions are bearings an aircraft would follow on take-off for travel between the two positions. As a practical matter, one commonly finds direction between two places by consulting a map. A map is a projection of the spherical surface of the earth onto a flat plane. There are an infinite number of ways to do this. All such projections distort the surface of the earth, and no such projection can be said to be truer than any other. On any map, one can draw a straight line between two places. For each case, the line on the surface of the earth would be curved, since there is no such thing as a straight line lying on a sphere. Moreover, a straight line drawn on one map will be curved on another map made using a different type of projection. Thus one must use care and understand fully the type of projection before using a map to determine direction! One commonly used map is made with a Mercator projection. A Mercator projection is a depiction of the earth that has the properties that lines of constant longitude (meridians) meet lines of constant latitude at right angles. On such a map Mecca would be to the east-south-east of San Jose. This corresponds to a common sense understanding of direction one obtains from looking at a globe. If on a globe Mecca is to the east of San Jose (as it is, by a large amount) and to the south of San Jose (as it is, by a smaller amount), then it would seem it would be appropriate to say that Mecca is east-south-east of San Jose. That is how it appears on a Mercator projection. A map using a Mercator projection has another interesting and practical property. If one were to travel between two places always keeping the same bearing (keeping the same angle between true north and the direction of travel), then the line of travel would be a straight line on a Mercator projection. Such a line is called a rhumb line, and is used extensively for navigation purposes. An argument has been made that great circle should be used to determine direction to Mecca because it is the shortest route. We note that although the great circle route between two points is the shortest distance between the point, in most situations it is not significantly shorter than the distance along the rhumb line. For example, the great circle distance between San Francisco and Mecca is 4,285 nautical miles, while the distance along the rhumb line is 4,417 nautical miles, only 132 nautical miles longer. In the end Dr.Burton F Jones says that he will make no comments on what definition of direction people of the Islamic faith should use in deciding on the direction of Mecca. However, he hopes the above discussion proves helpful. The digital map, (see www.nationalgeographic.com /mapmachine/), is a composite of about 500 satellite images. The images were taken over a period of several years. Cloud-free images are mostly used. The composite map was projected into the Equirectangular projection (a projection is a flat representation of the globe). The Equirectangular projection is a cylindrical-type projection like the Mercator. It is hard to give a direction between the United States and Saudi Arabia both are large countries. However, from Washington, DC you would need to turn East-South-East to face Mecca (or if north is 0 degrees, you would turn 100 degrees to face Mecca). Senior Editor, National Geographic Maps. Imagine that the surface of the map as cylinder that encircles the globe, touching it at the equator. The parallels of latitude are extended outward from the globe, parallel to the equator, as parallel planes intersecting the cylinder. Because of the curvature of the globe, the parallels of latitude nearest the poles when projected on to the cylinder are spaced progressively further apart, and the projected meridians of longitude are represented as parallel straight lines, perpendicular to the equator and continuing to the North and South poles. When the cylinder is slit vertically and rolled out flat the resulting map represents the Earth’s surface as a rectangle with equally spaced parallel line of longitude and unequally spaced parallel lines of latitude. Although the shapes of areas on the cylindrical projection are increasingly distorted towards the poles, the size relationship of areas on the map is equivalent to the size relationship of areas on the globe. * Lines of latitude and longitude are parallel intersecting at 90 degrees. * Scale along the equator or standard parallels is true. * Rhumb Lines are straight lines. Great Circles are curved lines. Can have the properties of equidistance & conformality. The familiar Mercator projection is basically a cylindrical projection, with certain modifications. A Mercator map is accurate in the equatorial regions but greatly distorts areas in the high latitudes. However, directions are represented faithfully. Any line cutting two or more meridians at the same angle is represented on a Mercator map as a straight line. Such a line, called a rhumb line, represents the path of a vessel following a steady compass course. Using a Mercator map, a navigator can plot a course simply by drawing a line between two points and reading the compass direction from the map. Distance measurement from the map needs to be made using the latitude scale surrounding the distance to be measured- as long as each measured distance segment is no longer than 200 NM. Azimuthal projection maps are useful for viewing the polar regions of the world, because the poles usually appear near the center, with longitudinal lines meeting at the poles and spreading away from each other as they move away from the poles. The polar regions are relatively free of distortion, but the distortion increases as the longitudinal lines move toward equatorial areas. Two other types of plane projection are known as the azimuthal equal area and the azimuthal equidistant; they cannot be projected but are developed on a tangent (touching) plane. The gnomonic projection is assumed to be formed by rays projected from the center of the Earth. In the orthographic projection the source of projecting rays is at infinity, and the resulting map resembles the Earth as it would appear if photographed from other space. The source of projecting rays for the stereographic projection is a point diametrically opposite the tangent point of the plane on which the projection is made. The nature of the projection varies with the source of the projecting rays. Thus the gnomonic projection covers areas of less than a hemisphere, the orthographic covers hemispheres, the azimuthal equal area and the stereographic projection map larger areas, and the azimuthal equidistant includes entire globe. In these types of projection, however (except in the case of the azimuthal equidistant), the portion of the Earth that appears on the map depends on the point at which the imaginary plane touches the Earth. A plane-projection map with the plane tangent to the surface of the Earth at the equator would represent the equatorial region, but would not show the entire region in one map, with the plane tangent at either of the poles, the map would represent the polar regions. Because the source of the gnomonic projection is at the center of the Earth, all great circles , that is, the equator, all meridians, and any other circles that divide the globe into two equal parts, are represented as straight lines. A great circle that connects any two points on the Earth is always the shortest distance between the two points. The gnomonic map is therefore a great aid to navigation when used in conjunction with the Mercator. Great Circles are straight lines representing the shortest distance between two points. Rhumb lines are concave toward the nearer pole. Scale is correct only at the center becoming increasingly distorted with increasing distance from the center. The magnetic compass is a self-contained unit, which does not require electrical or suction power. To determine direction, the compass uses a simple bar magnet two poles. The bar magnet in the compass is mounted so it can pivot freely and align itself automatically with the earth’s magnetic field. The angular difference between the true and magnetic poles at a given point is referred to as variation. Since most aviation charts are oriented to true north and the aircraft compass is oriented to magnetic north, you must convert a true direction to a magnetic direction by correcting for variation. The amount of variation you need to apply is dependent upon your location on the earth’s surface. Deviation refers to a compass error which occurs due to disturbances from magnetic fields produced by metals and electrical accessories within the airplane itself. Although it cannot be completely eliminated, deviation error can be decreased by manufacturer-installed compensating magnets located within the compass housing. The remaining error is recorded on a chart, called a compass correction card, which is mounted near the compass. When the bar magnet contained in the compass is pulled by the earth’s magnetic field, it tends to point north and somewhat downward. The downward pull, called magnetic dip, is greatest near the poles and diminishes as you approach the equator.Although the compass is not subject to magnetic dip near the equator, as the compass moves closer to the poles errors resulting from magnetic dip increase gradually. Within approximately 300 miles of either magnetic pole, these errors are so great that use of the compass for navigation is impractical.In order to minimize the tilting force on the bar magnet caused by the magnetic dip, a weight is placed on the south end of the bar magnet. Unfortunately, the corrective weight, as well as magnetic dip itself, both contribute to acceleration and turning errors. “Private Pilot Manual”, Jeppesen Sanderson Training Products, Jeppesen Sanderson, Inc. Select the city in which you are located from the book and the read the Index Number. Place the Direction Finder, i.e. the Qibla Compass, on the floor and turn it until the needle (Compass North) points to the selected Index Number. The Minaret at the top of the Direction Finder (Qibla Compass) is now pointed directly to the HOLLY KAABA in Mecca. The Index Numbers have been scientifically calculated from the latest available geophysical and geodetic data for 1980. The point diametrically opposite to Mecca is located at latitude 21 deg 27 min South and longitude 140 deg 11 min West. This statement is misleading as the diametrically opposite point has nothing to do with the finding of the direction to Al-Qibla. This point is located in the South Pacific Ocean in the southern hemisphere and is to the southwest of Mecca.I suggest that he should draw an imaginary circle of any radius around that point and mark that circle into 360 degrees starting from 000 degrees to 359 degrees and make 360 persons stand on the circle at the interval of one degree each with their backs towards the sun and note in which direction all those persons would be facing. Obviously, they would be facing in all 360 directions. In case it is not possible to do that then he can simulate the situation on a paper and repeat the experiment. He can take Mecca as point A and the diametrically opposite point as point B. Obviously point B will be towards Southwest of point A. Join the two points by a straight line and draw a circle around point B and imagine people standing on that circle with their backs towards point B. Note the directions in which the people are facing. Or he can come out of his home and select a point diametrically opposite to his main door. Draw a circle around that point, ask some people to stand on the circle with their backs to wards the center of the circle and see how many people are facing the door. Mr. Khalid Shaukat, in answer to question number 8 para 2 (Frequently Asked Questions On Qibla Direction) dated 9/9/2000, has said, ” Latitude and longitude lines are arbitrary lines put by man and should not be considered at all for giving arguments about directions, because arbitrary lines chosen in another way would give another result”. I requested Mr. Khalid Shaukat as to what does he mean by this and why has he discarded the lines of latitudes and longitudes. But he did not answer this question of mine…I must say that these Earth coordinates are most important for specifying positions on the earth, estimating distances and directions between locations, doing aerial and naval navigation, predicting weather and astronomical phenomena at any location, carrying out an aerial survey and preparing different maps, and so on. These are also useful in computing the direction of Al-Qibla. Mr. Khalid Shaukat has also rejected the Qibla Compasses, which are available in Saudi Arabia. He has written about one of the compasses, which comes with a little booklet that has a list of cities and a number associated with each city in the range of 0 to 39, that it is an outdated booklet printed 20 years ago. He further says that the numbers in that booklet have slightly changed in 20 years because of continuously changing earth’s magnetic field. But he has said nothing about the booklets of the other Qibla Compasses, which has a list of as many cities and number associated with each city as the Compass recommended by him and available at Halalco Books. The Rulings and Response of Some Muslim Scholars and Shaykhs that Mecca is to the Southeast from North America. The Response of His Eminence, the great and knowledgeable Scholar of Hadith, the Renewer of the Century, Shaykh ^Abdullah Ibn Muhammad Ibn Yusuf al-Hurariyy al-Qurashiyy, may Allah protect him. The Ruling of the President of the Honorable al-Azhar University, Dr. Abdul Fattah al-Husayniyy ash-Shaykh, may Allah protect him. The Response of His Eminence Shaykh ^Atiyyah Saqar, the Chairman of the Fatwa Committee of al-Azhar of Egypt, may Allah protect him. The Response of the Mufti of Daghistan, His Eminence Shaykh Sayyid Ahmad Darwish Hadjieve ash-Shafi^iyy ash-Shathiliyy, may Allah protect him. The Response of the Mufti of Ukraine, the Honorable Dr. Ahmad Tamim ash- Shafi^iyy, may Allah protect him. The Response of the President of the Association of as-Sadatul Ashraf (the descendants of the Prophet, sallallahu ^alayhi wa sallam), in Lebanon, Shaykh Nabil Ibn ash-Shaykh al-Qadi al-Mustashar Muhammad ash-Sharif al-Husayniyy, al-Azhariyy ash-Shafi^iyy ar-Rifa^iyy, may Allah protect him. The Response of His Eminence, the great Imam, the Shaykh of al-Azhar, may Allah protect him. The Response of Hazrat Allama Maulana Mufti Mohammad Akhtar Raza Khan Qadri Azhari, President: All India Sunni Jamiatul Ulema, Head Mufti: Central Darul Ifta-Bareilly, may Allah protect him. The Respons of Some Astronomers, Geographers, Universities, Geographic and Marine Institutions in the United States of America and Canada that the Direction of Mecca is to the Southeast of North America. Response of Derrick H. Pitts, Vice President, Fels Planetarium, Franklin Institute Science Museum. Response of Eugenia M. Ryan, Research Correspondence, National Geographic Society. Response of Cdre. A Sadek, President, Arab Institute of Navigation. Response of Dean Louder, Director, Lavel University. Resposes of Brian Klinkenberg, Department of Geography, University of British Columbia. Response of Paul Jance, Cartographer, The University of British Columbia. Response of T.R. Moore, Associate Professor of Geography, McGill University. Response of B.A. McIntosh, Ph.D., National Research Council, Canada, Herzberg Institute of Astrophysics. Response of DB Knight, Professor of Geography, Carleton University, Ottawa, Canada. Response of Dr. David B. Frost, Associate Professor, Department of Geography, Concordia University. Response of Andrew Berghardt, Professor of Geography, McMaster University, Ontario, Canada. Allah has said in Suratul-Baqarah, “Ayah 150” [from wherever you start, turn your faces in the direction of the Sacred Mosque and wherever you are, turn your faces in its direction.] 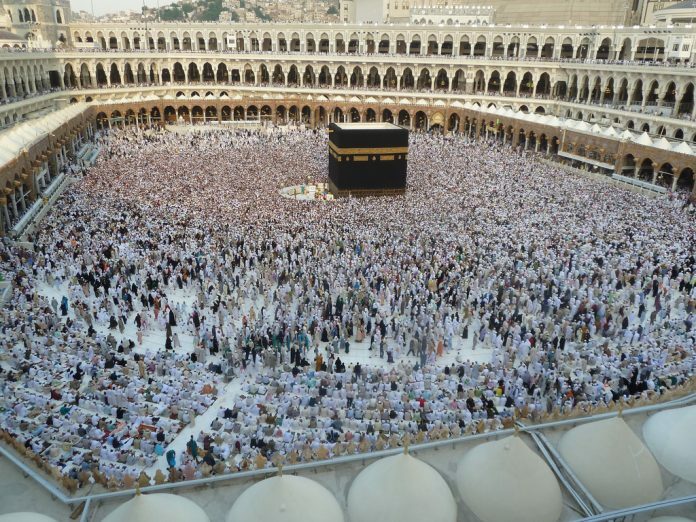 It is mandatory for the Muslims to face in the direction of al-Qiblah while offering their prayers. Allah further says in Qur^an that take guidance from the stars and the marks through the darkness of land and sea. It is nowhere mentioned in any text that the reliance is on the shortest distance, or on stretching a string between two points as some intelligence-claimers voice to-day. The spherical trigonometry formula gives you the initial bearing of the great circle arc between two points on the same great circle. As the great circle path is divided into numerous straight-line (Rhumb line) segments, lot many times one will have to calculate the new bearings. It is difficult to do the calculations for every sector. This process is very complicated and 98 percent of people or more do not understand such procedure. Allah does not make things difficult for human beings. It is agreed that an arc of a great circle represents the shortest distance between two points on a sphere. Because a great circle line follows the curvature of the Earth, it forms a curved line rather than a straight one. In long-range navigation, great circle routes are desired. Since the great circle is not a straight line and therefore difficult to follow. It is divided into a sequence of shorter rhumb line segments. The bearing keeps changing along the great circle path on the surface of the earth. For example, a great circle path may start out heading northeast, gradually changing the heading to the east, then gradually change it further to the southeast and so on. The only exceptions are the meridians and the equator, which maintain constant direction. Rhumb line is a straight line on the surface of the earth that crosses all the meridians at the same angle. Ideally, straight line segments are sought because they are easy to follow compared to curved lines. Some people argue that the great circle should be used to determine the direction to Mecca because it is the shortest route. Please note that although the great circle route between two points is the shortest distance between the points, in most situations it is not significantly shorter than the distance along the rhumb line. For example, the great circle distance between San Francisco and Mecca is 7,285 nautical miles, while the distance along the rhumb line is 7,417 nautical miles, only 132 nautical miles longer. Great circle path is a route and not a direction. The Direction is a straight line between the observer and the object. All this is universally agreed upon. It is, therefore, recommended that we must not follow a great circle path while facing in the direction of Mecca. Rather, we must follow a straight line. On the globe all lines are curved and there is no straight line. For that projection (Representation of the globe on a flat map) is a must. The best projection is the Mercator Chart The Mercator chart is most commonly used by NASA, National Geographic Society, the airlines and the Navy for navigation purposes… The Globe is covered with a network of Meridians and parallels of latitude. The parallels of latitude are perpendicular to the meridians. If you see the globe and Mercator Chart you will find that Mecca, in general, is towards the southeast from North America or east-southeast from some places in North America. I would like to say here that if anyone who does not agree with me or with other persons, who say that Mecca is to the southeast of North America, he is at liberty to contact the Religious Scholars, Astronomers, Geographers teaching in different universities in U.S.A., Airlines Pilots and Navigators, NASA or the National Geographic Society to verify the correct direction of Mecca from North America. I would like to point out that when something goes wrong with your car you always take the car to a technician and not a doctor. I think ISNA must approach the right persons for the advice on the correct direction of Mecca from North America. In the end, I must mention that Allah said in Surat Al-Ahzab, Ayah 36 which means: [When a matter has been decreed by Allah and His Messenger, there is no entitlement for a believer, man or woman, to have an option about the matter]. Everyone is answerable to Allah on the Day of Judgement. If we misguide the people in the religious affairs we must be ready for His punishment. May Allah guide us all! Amin. Late Mr. Muhammad Afzal Khan, NON-Habashi / Al-Ahbash (a stray sect among Muslims), was a retired Pakistani-American Pilot. Can U.S. military deployments make war with Iraq less likely?